iPads (except for the original iPad) come with cameras — two, to be exact. These cameras allow you to capture video and photos. And because one camera is front-facing and the other is rear-facing, you can switch between them to capture images of yourself holding the iPad or images of what you’re looking at. On an iPad, the front-facing camera captures high-definition video at 720p; the rear-facing camera captures high-definition video at 1080p. When you capture photos, they appear in the Photos app’s Camera Roll, where you can view them, e-mail them, and so on. The Photo Streams feature lets you share groups of photos with people using iCloud on an iOS 6 device or later, or on a Mac computer with the Mountain Lion OS or later installed or on a PC via iCloud. If you have a printer that’s compatible with Apple AirPrint technology, you can print photos. As of this writing, most major manufacturers offer printers that have this capability, and you can bet that Apple’s working with other manufacturers to provide more compatible choices. 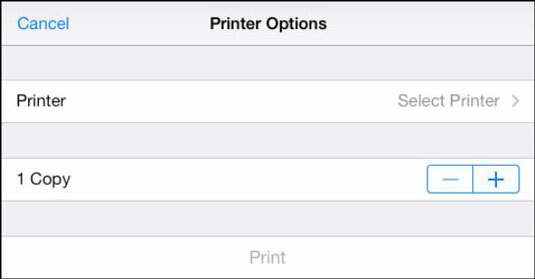 However, if you don’t want to spring for one of these models, you can also use apps such as Printopia and HandyPrint to provide this functionality to other printers on your network. If you don’t have access to this kind of wireless printer, when you plug iPad into your computer, you can sync them via iTunes. With Photos open, maximize the photo you want to print. Tap the Share icon and then tap Print. The Printer Options dialog appears. iPad searches for a compatible wireless printer. Tap the plus or minus signs in the Copy field to set the number of copies to print. Your photo goes on its way to your printer.